We sat in the hallway of the courtroom waiting for the doors to open. A palpable anxious feeling was in the air. I held a friend’s hand, got on my knees, and prayed. Oh, how I prayed that justice would be done, that the eyes of the judge would be opened to the truth, and that lies would be exposed. What this lady did not know is that I had secretly contacted many people and had gained an army of those praying for us, for her, and for the judge. I wanted God to hear, and I knew He was listening. One thing I learned about our judicial system is that many times the truth has no effect at all on the outcome. Time after time, lies were exposed, but because of technicalities and loopholes, the judges hands were tied. Each time we went to court, a little more of the truth came out, but each time was a setback. Our judicial system is flawed. A second thing I learned was to be patient and just trust that God’s timing would be alright. It took many years, and many times in the courtroom, and even a change of judges to finally have justice served. Our judicial system is flawed. The third thing I learned is that even in victory, the results are bittersweet. When one person has victory, another may suffer from that defeat. We should never relish revenge. Instead, we should hope for a redemptive heart. Our judicial system tries to rehabilitate criminals but the system is flawed. 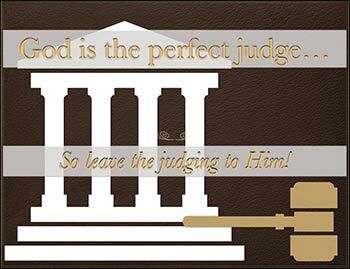 We can trust in God’s heavenly judicial system. If we are hoping for the downfall of someone who has greatly wronged us, we may want to rethink. There are three things we need to know about His system. First: We are not God. Matthew 7:1 says, Do not judge, or you too will be judged. If we look to Jesus, we see that He loved the sinner and went all the way to the cross for the sinner. He literally gave His whole life for His children, yet He said, I came not to judge the world. He was God in the flesh. He had every right to pass judgment, but instead He was full of love and forgiveness, healing and health, restitution and reconciliation. Second: Be still and know that He is God. Wait patiently for HIm. He will give you your heart's desires. This includes justice for yourself. Let Him be concerned for the justice of others. Third: God’s judicial system is not flawed. All have sinned and fall short of God’s glory, but all are treated as righteous freely by his grace because of a ransom that was paid by Christ Jesus. (Romans 3:23-24) We should pray even for our greatest enemy because we were once the enemy, and God showed mercy to us. If one is lost, it is not a victory. A victory is when ALL belong to Jesus. When every knee bows before God, this will be a true victory from a perfect judicial system.